Goofing around mid-run in the Philadelphia's Fairmount Park. 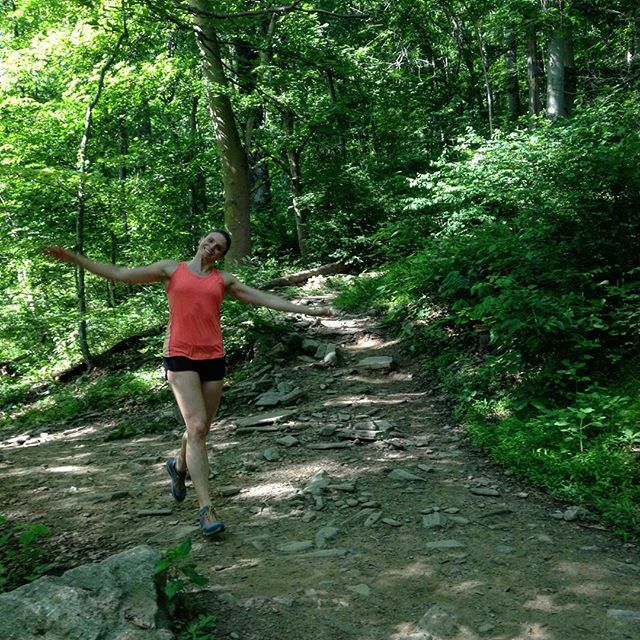 Though running isn't my primary sport, this summer, I fell completely head over heels in love with trail running (three or four miles at a time). Trotting through the trees, hopping over rocks, dodging branches, and navigating over roots is a lot more fun to me than running on pavement. As with any sport, sport-specific gear and apparel makes for a more comfortable workout. I'm used to flat minimalist-style shoes in the CrossFit gym, (CrossFit is my primary sport), but knew I'd need something with more cushioning to take on the rocky trails in my backyard. 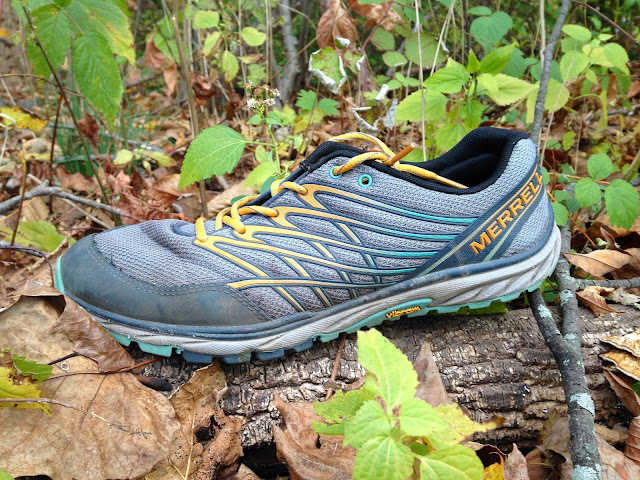 Merrell is one of my go-to footwear brands because no matter the model, Merrell shoes just fit my feet. And the Women's Bare Access Trail shoes were no different. Spoiler alert: I love these shoes. As soon as I opened the box, I knew I was going to love the Bare Access Trail shoes. The size 10 shoes fit my size 10 feet perfectly. I normally wear thick socks to add volume to my narrow feet when I'm wearing running shoes, but with the Bare Access Trail shoes, I was able to revert back to my normal low cut thin socks. Folks with a wider mid-foot, take note; they might be too narrow for you. When I laced them up, my feet felt locked in and once I started running, my feet didn't move inside the shoes at all. The wider toe box gave my toes room to spread out, but not too much room. They're low cut, lower cut than I'll normally go with a running shoe, but any worries about my feet slipping out were The Monument/Flame color scheme pairs a relatively normal gray color with light blue and orange accents. They're also available in a black and purple scheme, but I love the more muted, but still fun and more natural color combination. Though some running and hiking kicks I've tried feel great the first time I lace them up, some pairs require a handful of miles and blisters before they mold to my feet. Not so with the Bare Access Trail shoes. I laced them up, went for a run, and they felt like they were made for my feet. Being able to forgo the break-in period and any potential blisters is always a plus. With respect to comfort, the Bare Access Trail shoes are as good as it gets. They feel like minimalist shoes - barely there - but provide plenty of shock absorption. The M Bound™ midsoles cushion effectively on rocky terrain without compromising my feel for the ground and the breathable upper kept my feet vented in temperatures up to 85ºF. The protective toe cap also comes in handy, especially on a recent five-miler in Philadelphia's Wissahickon Gorge when a rock jumped out of nowhere and tried to trip me. The ankle collar is lightly padded, making them even more comfortable. But they're about as low as low running shoes get. Initially, I was concerned my heels might just come right out of the shoes. They haven't, but if you're prone to ankle rolling when you're running, you might find these too low. The M-Select GRIP treated Vibram® outsoles have moderate tread on them, which helps keep my feet connected to the ground on just about any terrain. I did slip a bit running down a steep slope over fallen leaves, but that's not surprising on that type of terrain. Even with outstanding traction, the Bare Access Trail shoes are flexible and my feet moved naturally. Since that first fateful run, I've put almost 50 trail miles on them, and though the upper is starting to show some wear, they function as well as they did on day one. Bottom line? I absolutely love the Bare Access Trail shoes. When I need to replace this pair after they've run as far as they'll run, you can bet I'll look for a new version of the same kicks. They're comfortable, look good, perform well, and allow me to concentrate more on the run than what's on my feet. Huge thanks to Merrell for the complimentary pair of shoes to test out. 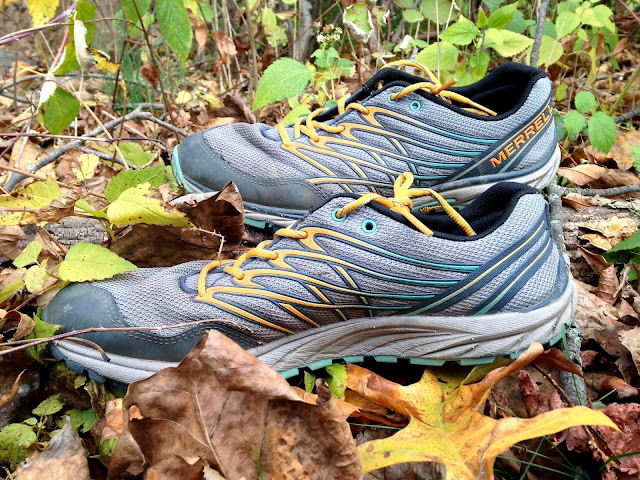 If you're a trail runner, what's your favorite pair of kicks? Have you tried these, or other trail shoes from Merrell? We'd love to hear from you in the comments!